Kani waa maqaal ku saabsan magaalada San Fransisko, Kaliforniya, Maraykanka. Boga "San Francisco" halka ayaa laga soo toosiyay. ↑ "Communities of Interest - City". California Citizens Redistricting Commission. Retrieved September 23, 2014. ↑ "Members Assembly". California State Assembly. Retrieved September 23, 2014. ↑ "Directory of Representatives". U.S. House of Representatives. ↑ "Office of the Mayor : Home". 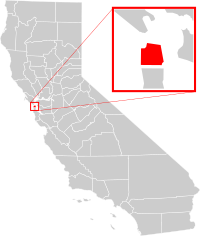 City & County of San Francisco. Retrieved December 10, 2014. ↑ "Elevations and Distances in the United States". US Geological Survey. April 29, 2005. Retrieved October 29, 2014. ↑ "American FactFinder - Results". US Census Bureau. Retrieved March 1, 2015. ↑ "NPA City Report". North American Numbering Plan Administration. Retrieved November 5, 2014. Boggan waxaa markii ugu dambeysay wax laga bedelay 10:57, 17 Diseembar 2018.